In the weeks prior to my high school graduation, our focus was solely on earning excellent marks on all of our finals exams. Or 1/100th of focus was spent on that and the remainder was spent on two elements of real importance: graduation trip to Hawaii and how to obtain a quality fake ID before departing for that trip. BUT, they worked perfectly during our trip. Why? Because the establishments we used them in were built for fools like us who would pay $8 back then for a watered down and brown Long Island Iced Tea. But oh, how wise and grown up we felt. Yes, the ID indicates we were 21. Never mind we were acting like we were 16 every time we used them. My freshman year in college, I was more daring. The bars at school were ruthless about carding people often paying doormen and bouncers $50.00 per fake ID they retained. Walls of many bars were covered with the clever (and sometimes shameful) attempts to be of age. An older friend supplied with her ID. In brazen antics, I took it to the DMV. My pals Muppet and KitKat were with me. As they chatted up the DMV employee, I shenaniganed my way into having my picture actually put on the photo. Surely, there could be no better fake ID than this. It was my photo! How genius. So I tested it as a famous bar across the street from our house. I easily passed the doorman. Until a complete and utter tool of a bouncer saw me and came in hot pursuit. He went to my high school so I felt it was an unjust use of hometown knowledge. But I fled before he could confiscate. However, I did not flee before I told him he was a complete and utter tool of a bouncer. The desire to run my mouth even as I was running out the door was great indeed. This ID served me well for two years and I was the King Pin of buying alcohol for all of our friends. I was also crafty and clever and handled my ID with the same care the Hope Diamond would require. Never to lose it or mistreat it. Never. The summer after my sophomore year, I spent three months at my parents house in Alaska. One afternoon, I returned home and in my room found my freshly laundered clothes in a tidy stack courtesy of my Mom. Delicately laid on top of said pile was my fake ID. Quick assessment confirmed: this is not good. I had left it in my jeans from an outing the night before. CURSES. Later, my Mom asks me if I realize it is illegal to tamper with an ID. I explained I in fact did not tamper with it. She asked for an explanation. So I explain that I went to the DMV and through powers of persuasion and friendly distracting chit chat, I was able to get my photograph on someone else’s ID. The more important question I should have asked myself is: Why can I not shut my yap??? My Mom asked if I realized it is a federal offense to do what I did. I am but a mere college student, I replied. The letter of the law is outside my sphere of knowledge at this time. She asks me to gauge my Father's response should I get arrested for using this ID. I replied I would not call him because surely he would be too busy for such a call. Her response, “Oh, I am going to be too busy to take that call as well.” Damn. Later in college, when fake ID was no longer an issue, I actually gave my ID to a younger girl in my house. The only caveat was a list of bars she could never enter because we knew people who worked there. Did she listen? NO. She got a small albeit humorous payback but that is a story for another day. And that same year, took us one night to see a friend emplyed at the bar infamous for welcoming patrons regardless of age. You simply had to have ID, not ID that passed any scrutiny. This bar didn't care about fines from the Liquor Control Board because they were making wads of cash off the innocent lambs bleating through the doors. We were loitering outside with him and an unexpected snafu required him to leave his post. He asked if I could step in and check IDs for a few minutes. Are you kidding? I would love the opportunity to see the clown show of IDs pouring into this place even for ten minutes. I think this boy was an easy five years from getting his first chin hair. Did I let them in? Of course. Nobody wants to be the complete and utter tool of a bouncer. Plus, I didn’t actually work there. And I didn’t want to be trapped in a stream of crying 18 year olds either. And DO NOT FORGET to enter the Pack Your Bags Giveaway! Ends 8/8/2010. Obtaining that first fake id is a right of passage for every teen, though I must admit the whole DMV thing was very clever. Of course, here in Canada teens get to become slothenly alcoholics two years before our counterparts in the states....legally. haha I remember when everyone in high school was scrambling to get fake IDs. Oh the humor! I actually never had one in high school, and then I went to university in Quebec, where the drinking age is 18, so I never ended up needing one. Although it was frustrating to spend four years in Canada being treated like an adult, and then coming home to the US for christmas break and not being able to go out to bars because I didn't have a fake. Ah well, those days are long behind me! ... good times! bwhahaha hownice that you got to be on the other side of the bouncer job. I never had a fake ID cause our bats let in 18 yr olds.. and I would drink the legal ones drinks .. OH!! Long Island Iced Tea is my Fave drink. It will also set you on your arse. I was fortunate to grow up when 18 was the legal age. I also had hair on my chin way before 18 so I was buying beer without even being asked for id at 16. We could actually have open containers in the car and drink a cold one while driving at the time as long as you wernt drunk. Fine Line. Oh how times have changed. I never had a problem with ID's. I was always older looking than I was so they just looked at it real quick to see if the pic was the same. Never once did I get caught! I think the youngest I was to get in a bar was 16. Great story! Ha! So funny! I used my sisters ID when I was 15. She is 8 years older then me. It was summer and we were both really tan with long dark hair. I got drunk and kissed a blue eyed boy. I never used it again but it was one fun night! Hahaha! I was quite a forger in my youth - and I also looked a lot older than I was. Very well... uh... developed, you might say. Maybe they weren't looking at my face. Dunno. Although I had my amazing fake ID, created by myself and laminated to boot... I was never once carded from the time I was 15. Simpler times though - if my 15 year old daughter pulled that in this day and age I'd be all over her like a short overcoat! God I'm old. Too funny! Just wait til MiniMac gets his fake ID! Well, at least he has a lawyer! Tee Hee. Ohhh fake ID's and the innocence that they take and the fun that they give away. I had one too, and it was a ritual to pass it along to the next girl but they never listen to the directions, ending in a failure almost always. But it was fun while it lasted. When I was in the military (1993), they messed up my DOB on the back of my ID so that the crossbar of the "4" in 1974 was right on the line of the box surrounding it. So it looked like 19711. I expertly took a pen and closed in the ones, and Waalaa! 1970! Of course, being a military ID, most people didn't really scrutinize it. guess they figured, if I was old enough to die for my country, I was old enough to have a beer. I still remember the name of my first id. Regina. She was 26 with tall mall hair. I was 19 with stick straight hair. Didn't matter most of the time. Oh the days of fake id's. Sounds like you had a blast with yours. I am so impressed that you got yours from motor vehicles though! Years ago one of my friends had hers confiscated from a popular downtown Annapolis bar. Not easily defeated, we approached a police officer and and she gave him a sob story about the bouncer stealing her id. He actually got it back for her and we promptly entered another bar and had a blast of a night! Your stories make me realize what a boring young person I was. (Still am). Never would've occurred to me to even want a fake I.D. LOL. I was such a goody-goody I never would have dreamed of trying to get a fake ID. Granted, I did drink when we went back home to Louisiana and the legal age was still 18, but not back in Florida. Then again, I get carded more, now, at 34 than I did at 21. That reminds me of my father's favorite piece of advice to me when I hit my teenage years..."if you ever get arrested, don't waste your one phone call on me, 'cause I'm sure as hell not coming to get you." You know, I never had a fake ID. In my city no one ever seemed to card anyone so I was slipping into pubs quite confidently at 16. Since the drinking age was 18, it's not that hard to do as a 16 year old wearing make up looks pretty much the same as an 18 year old wearing make up! The first time I ever was carded was the week after my 18th birthday at a bar I'd been going to for about three years. 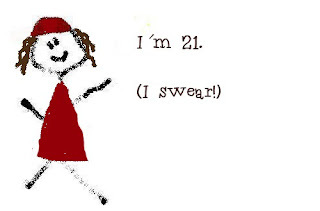 And I was actually LEGALLY old enough to consume alcohol at the time. "Yes I DO have id" I said triumphantly when asked and waved it in his face. Then he informed me the pub had changed hands and raised the entry age to 21 so it could get a late hours license, therefore, I was still underage and could eff off. I never had a fake ID just borrowed IDs from friends...friends who were usually six inches taller with different hair/eye color. It usually got a chuckle from the bouncer as I entered the bar. When I visited my brother in college, he borrowed an ID from a fellow student for me. Her name was identical to mine...just two years older. I never had a fake ID, and neither did any of my friends. Yet somehow, we could always get alcohol. Oh, the life of a college student! Great story! And every time you tell one of these doosies, your parents have, yet again, let you continue to live! I am reminded of a song by Barnes and Barnes, "I Gotta Get A Fake ID" that played on the Dr. Demento show. MiniMac would probably enjoy air guitaring all the songs on the Dr. Demento 25th Anniversary Collection music CD. Oh, I love it! I was the first of my friends to turn 21. Which means I had the choice job of being the liquor run girl after that. I'm six years older than my little sister (we must look like eachother because people ask us if we're twins all the time) so, being the cool big sister I am, I went and got a state ID that she could use. And never had a problem. The bars in my college town used to let in minors until midnight, and would use permanent markers to mark our hands with huge black X's so the bartenders could tell who was underage. the parade of minors from the front door straight to the bathroom to scrub, scrub, scrub those X's off was hilarious. When a relative was in nursing school, she took the birth certificate of a girl who had died (can you spell i-l-l-e-g-a-l? ), and had an ID done up with her picture. I did it the easy way, a cousin had parties every Saturday night and I stayed the weekend. That was when I was introduced to 151 and Coke...I was 15. When I was 16, and looked 12, I could still walk into a convenience store and buy beer. No one cared. Later, I had my senior year of high school at a boarding school in Switzerland where we were allowed to drink at 17. My own state raised the drinking age to 19 just a few months before I turned 19, so I only needed a fake ID briefly that year. Holy crap! How come I never heard of this place in Seattle that dispenses fake IDs?! I practically lived Downtown while I was in high school. Hilarious story! I'm too honest, if I had a fake ID I would probably tell on myself, I would probably get the bouncer to double check it before letting me in, lol. So many good stories are linked to fake IDs and I would expect nothing less from you. Hope you're having a great time with your family!! Oh how I miss those days. My tool of a brother swiped mine when he caught me in a bar hitting on his friend. He was a cop and I'd rather be bailed out by him (which I was-A LOT) than piss him off. They card if you look under 40 here in KS now and I'm never carded. I just want to be carded! Hilarious!!! The chances you took with a cop for a mother and a future as a lawyer in the wings!!! I was never brave enough to try a fake id!! I never had a need for fake ID. I just hung out with the older kids who had access! Oh to not look this old now! Fun story! Bwahahaha! When I was a Freshman, a friend of my roommate's was a Russian on a study abroad program and she gave me HER roommate's passport (also Russian) to get me into a bar. I looked NOTHING like the girl in the passport photo, and when the bouncer tried to question me about it, I just stared at him and kept silent. My roommate and her friend told him I was visiting from Russia and didn't speak any English. He let me in! Another time at this same bar My much older cousins were going (they're about 14 years older than me) and one of my cousin's boyfriends (he was in his late 30's/early 40's and very gray) decided he could get me in. He just put his arm around me and drug me past the bouncer while everyone was else was being carded. My boyfriend at the time was 21 and laughing so hard (because cousin's bf really did drag me through the door) he nearly didn't get in because the bouncer didn't believe his ID was real (which is was). Oh, the things I don't want Indy to do when he's older. This story was great. I especially liked the picture of the hand drawn ID. I never had to get a fake id because so many bars and clubs here would serve underage. Or we'd drink before we went. Or have someone else buy it for us. It's so easy to be bad. I never tried to get a Fake ID, but I did use every single OF AGE and BLONDE girls in my house in every college I attended until I turned 21!!!! Oh yeah, I was one who got busted by ABC agents my sophomore year in college. Thankfully, my mother didn't find out or I'd have never made it to be 21! At a bar by Cal Berkley, I tried handing over my real license, with the 7 sloppily turned into a 4... with pencil. The bouncer had such a sneer of contempt for me that I started apologizing to him while he was still in the process of shoving it back to me and telling me to get the "hell outtahere!" I did not know a toy could do that. My arse has had enough! Apparently, your vajayjay needs a gym membership.